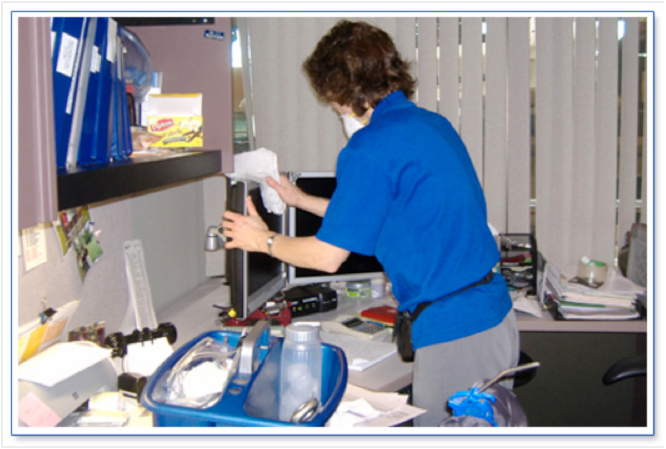 On-Site Professional Computer and Electronic Equipment Cleaning Services exists to provide a professional sensitive office equipment cleaning service in a manner that is efficient, quick, safe, trouble free and beyond reproach for both our Clients and Staff. This Service should enhance the professional environment of our clients as well as remove bacteria, which will in turn create a healthier environment for their staff and clients. Thank you for the opportunity to provide you with information about the professional cleaning and sanitizing of your sensitive electronic equipment. We appreciate the opportunity! In order for you to make a decision about having your computers and telephones cleaned and sanitized, you might like to know something about us. We are the largest computer cleaning company in Calgary – and probably all of Alberta – with clients from Lethbridge to Edmonton… and we are the front runners in meeting the changing needs of our clients. Because of this, our mandate is to remain on top of this emerging industry. We are in the position to address our clients’ need. We would like to discuss with you the amount of equipment you have and the frequency with which we would clean and sanitize all the sensitive electronic equipment in your office. I have personally been involved with the Computer and Electronic Equipment Cleaning industry since 1996. In our efforts to find products to do the job we wanted, we found there was nothing acceptable in the market. You will find lots of pertinent information about our service on this website and some articles of interest regarding our emerging industry. I hope you find it of value – whether or not you choose On-Site as your provider for this important service. We look forward to earning your business and working with you.